Our commitment and efforts for Young Student Jazz Musicians is our favorite aspect of True Blue Jazz, and a priority for us. 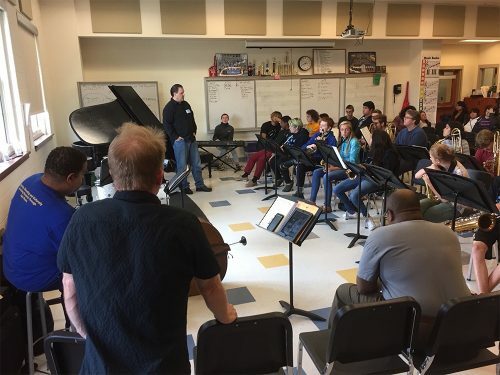 In 2013, True Blue Jazz revived theSaturday Afternoon Free Concert on the Rehoboth Bandstand as a feature venue for the Cape HS Jazz Band….and in 2015, we held our first Jazz Workshop/Clinic, placing our Featured Artist Jazz Players in a mentoring musical exchange with the Cape HS Jazz Band. We continue that as an annual staple of True Blue Jazz Events & Programs. Our 2017 Jazz Workshop/Clinic will be conducted by our FridayNight Headliner Artist & Act – The Paul Carr Quartet. Paul Carr is President & Executive Director of The Jazz Academy of Music in Silver Spring, MD. Paul Carr also holds the distinction of being the Executive & Artistic Director of the Mid-Atlantic Jazz Festival, held annually in Rockville, MD. Mr. Carr serves as the Conductor for both the Mid-Atlantic Youth & the Collegiate Orchestras.